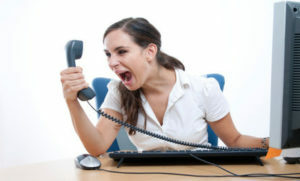 Really, Really Bad Customer Service | Shoppers, Inc.
Greetings from Shoppers, Inc.! We hope you enjoy the article below from John Tschohl about customer Service and irate customers as much as we did. There’s Bad and then there’s REALLY Bad customer service. The recent experience I had with Dish Network qualifies for REALLY, REALLY Bad customer service and it just doesn’t get much worse than this. They did absolutely everything wrong they possibly could and then some. To start out with, my wife and I just bought our neighbors house and they had Dish Network. They moved but left all the equipment. My intent was to simply get approval to let me assume the equipment and subsequent billing for this service. I called at 7:30 PM and the voicemail system said it would be a 10-minute wait…it was 20 minutes. They said if I pushed “1” or “2”, Dish would call me back in 10 minutes….it never happened. When an employee was finally reached, I was asked to put the original homeowner on the phone to get the equipment transferred. His wife took the call. The Dish Network employee then insisted that her husband be put on the phone (who by the way just had surgery on both ankles). She put him on the phone after listening to them for 10 minutes and he said to go ahead. Keep in mind he was in pain and she was babysitting for her grandchildren. The employee asked me to call him back again for approval for me to be invoiced on the account …. at that time we asked for a supervisor. She was worthless and lasted on the phone for only a few minutes before turning us over to a guy in the …fraud department. The entire call took 1 hour and 16 minutes and three times they suggested I use another firm. I am rating their service as -1 in 1 out of 10. I was not treated as a new customer (no discounts or specials. A day after this call I got a one-page advertisement from Dish with lots of specials) They did not know they were in customer service. They lied about the time that I would be on hold. I lost all trust. Be honest. Technology did not work when they say people will call back. I find technology does not work the vast majority of time. Management does not care. They never called me or the person whom I bought the house from by name. None of the employees have been trained on customer service. None of the employees know how to handle an irate customer. Employees really wanted me to use competitors. I kept telling them how bad they were at customer service. I have no patience for incompetent non empowered employees. All employees are “rule-driven.” The love policies and procedures. I sent an email to the CEO. A person on his staff called back the next day and apologized. They have 14 million customers and revenue of over $14 billion (I have no idea how they got so big) and he would not tell me how much money they spend on advertising. He did reduce the price and gave me some special pricing. The Internet has all sorts of special pricing. When I talked about empowerment he was very outspoken on why this is a bad idea since they had rules that have been around for 30 years. He said if everyone spent $5 on a customer they would lose millions of dollars. Very few customers will write the CEO, Joseph P. Clayton. They just say GOODBYE and you never hear from them again. I suspect they spend over $12 million a year on advertising. Half of this is wasted. They do not know which half. With empowerment you want employees to bend the rules. Save customers. Make customers over happy. Trying to get employees to make empowered decisions often times takes two miracles. NO firm will ever be a service leader without empowerment and service recovery. Less than 2% of organizations are good at these skills.